​JOIN THE 1ST GRADE AND MRS. BUSCEMI for the Annual Jungle Parade! First Graders will prance through the hallways on Friday, March 10 at 2:00 to show off their animal masks made in art class. Our mathematicians are learning the meaning and importance of the = equal sign. We know that whatever is on one side of the equal sign must be the same as what's on the other side. We were surprised to know it doesn't have to be only numbered. What's on one side might be two tens blocks (or lines to represent tens) and three ones (or dots to represent ones), and the other side might be 19+4. We are also learning to read number problems to UNDERSTAND the what is happening in the problem and what the problem is asking us to do. To help the students focus on the problem and NOT the numbers, I use numberless word problems. Sound weird? I thought so too! But by NOT having numbers in the problem students focus on the problem by answering these four questions. What is the problem MOSTLY about? Vocabulary- are there any tricky words for you? Watch these type of math papers to come home this week. The kids have gotten pretty good at learning to read a math problem for understanding. We have started to explore non-fiction texts. You may have seen a few come home this week. 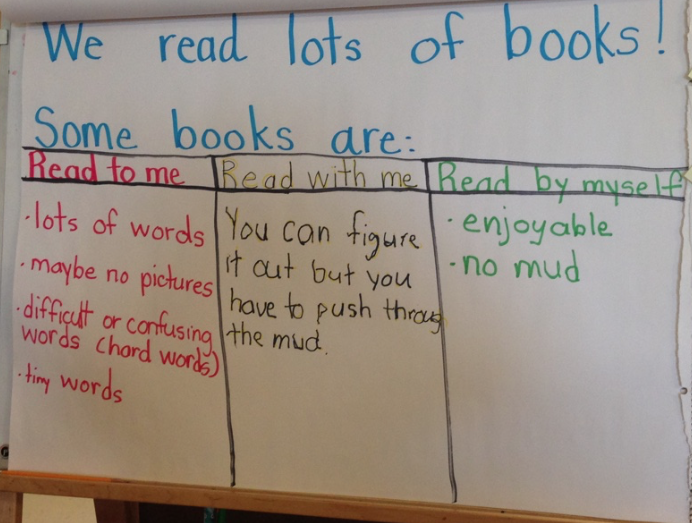 We have noticed the following about non-fiction texts. Our inquiry will continue as we learn to differentiate fiction from non-fiction and how to use the features of non-fiction to locate information. Thank you for your support in our writing challenge! I am so impressed with the energy of the kids! We have 10 writers you have written every day (so far)! I told the kids Weekend Writing Warriors are kids who write even on the weekend! Please encourage your writer to write and comment even on the weekend and over spring break! I have started posting what I am writing on my own blog, Primary Perspective, in the challenge on KidBlog, I want the kids to see I am writing right alongside them! 4/7- Guest teacher- Personal Day (visiting my daughter in Auburn Alabama War Eagle! 4/21--DCTrail Bike Rodeo and Playground night with Mr. D---more info to come! I take my time away from the classroom seriously, and I consider what pulls me away from the classroom critically. I am proud to be selected as a member of the Executive Committee of the Language Arts Committee. I am confident that the time I am out of the classroom for my work on this committee will benefit your children as I learn to look at my teaching with more intensity. I am honored to work with the district teachers and administrators of this committee, and I am eager to develop a document that will support all the students and educators of our community. The work you're your reader at doing shows! I am so impressed with readers stamina and ability to make meaning as they read. The whole reason we read is to get a message. We want to learn something new, how to do something or to travel to new places when we read. Without the message getting reading is powerless. Despite where your reader is in refining their reading tools. Matching a finger to one word at a time, using beginning, ending, even middle letters to read unknown words. Scanning pictures for word and meaning support, learning to use grammatically correct word choices, or pulling ALL these tools together to making reading looking effortless one thing I can count on is whatever word they choose, in error or correct the word will make sense! Making meaning as we read is the ONE skill we can't read without! As Addison and Gaven reported in the Celebrate~this week, we are working to make the students do more of the work than me. Did you know the one doing the most work is the one doing the most learning? I am currently reading, Who's Doing the Work? How to Say Less So the Readers Can Do More by Jan Burkins & Kim Yaris. I shared with the readers I learned I am helping them too much! When I say "Does that make sense?" or "Look at the letters." I am not allowing the time they need to think about what might help. Nor am I giving them the time to try out different strategies to see which one works best. So, now my prompts to a reader who I want to push further whether it's decoding an unknown word or thinking more deeply about a story I simply say, "Are you right?" or "How do you know? Or "What can you do to help you?" then, I wait. And this is the hardest part! When I wait, it allows the reader to think in their time and at their speed. I am so impressed with what these kids can do when given the time and power over their learning! The writers in our room are filled with ideas, craft, and energy for writing! Our Muscle Minute Mondays have helped these writers gather confidence and awareness of who they are as writers. As our focus lessons are gradually taking a turn to a new writing skill, I am noticing the writers are taking control of their stories and adding more details and interesting language to their writing. Our writers often talk to the reader, use dialogue, and make the reader feel they're in the story with them through the precise details they use. Check out our blog writing here to read exactly what it is I am seeing in these amazing kids! To maintain writing skills writers need to write regularly. Help your writer understand the power and purpose of daily writing. Enlist their help in writing store lists, taking drink orders for dinner as a waitress, writing postcards, cards, emails to others, allow them to blog often and then YOU can leave them comments for them and comment on the post of others. Allow your first grader to leave comments to friends, plan a summer trip, or make a list of free fun things you can do as a family. The possibilities are endless, and the power your young writer see will be the best commercial for life long writing! As our mathematicians work to make sense of problems and persevere in solving them they are instantly drawn to giving THE answer. While in math we want our kids to attend to precision and be accurate, knowing the answer (or working only for an answer) can interfere with their ability and willingness to make sense of the problem and reason abstractly and quantitatively. Mathematicians need to know more than the answer. They need to know what the problem is asking them to do, choose and use appropriate tools to solve problems, and to reason and critique their work and the work of their peers. We are no longer teaching answers, but we are teaching our mathematicians how to think. 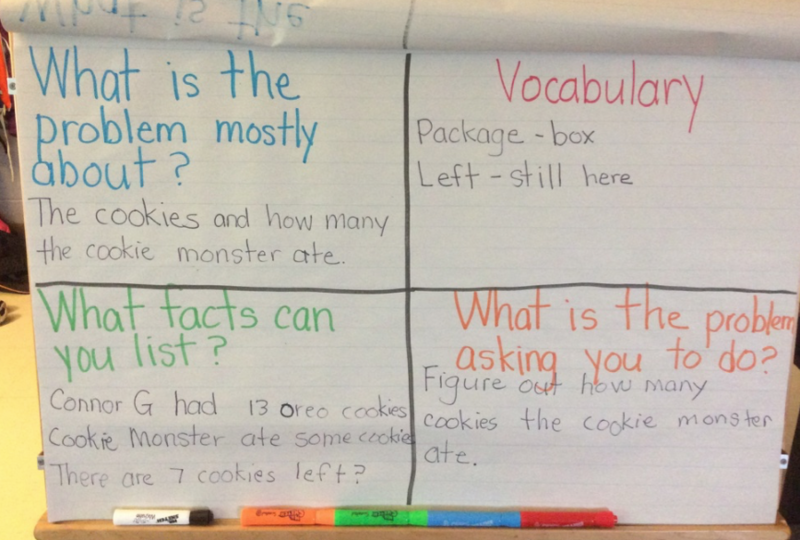 As you begin to see math work trickle home (in particular math stories) use the chart below to talk about the thinking behind the work. The Hilliard High School Alumni Association has established the Educators of Excellence Award as a way of recognizing educators who have made a difference in the lives of Alumni and/or current students in the Hilliard City School District. The Award is given annually to one educator from each school building who exemplifies a commitment to excellence in education. You can click here for more information and a nomination form. For our next parenting workshop, we will be showing the movie SCREENAGERS: Growing Up in the Digital Age. This is a documentary about the biggest parenting issue of our time. If you are watching your kids scroll through life, with their rapid-fire thumbs and a six-second attention span and you are looking for insights from doctors and authors, please make plans to attend this amazing film. It will take place in the Darby High School PAC, on February 15. Note this is a change in the location! You can click here to get free tickets and learn more. Today we are bringing home our Weekend News, or Monday Muscle Minutes! I hope you will sit down with your first grader and look through this book. We have been writing in this space each Monday for the entire year. In the past 6weeks we have been writing without stopping for a set amount of time each week to help us build stamina and to discover how writing builds more writing. This is not the space to worry about spelling, periods, or handwriting. This is space where our writers simply learn to let go and write without worry! You might notice the length of writing has grown, the ideas are becoming more connected and are coming more easily! Sit down with your writer and ask THEM to share what growth they see! Then, over break invite your writer to return to this book and write! Return the book Monday! Addison, "My words were crooked and now they're straight.
" Mason W., "At first, I wasn't writing about my weekend and now I am." Gaven R. , "I just had a little bit of words at the first part and now I have a lot of words.
" Mason V., "I didn't have a lot of words and now I have feelings." Shannon C., "In the beginning my writing didn't have details and now I have lots of details." Monday, November 7 at Station Sixth Grade at 7:30pm. If you are unable to attend, we want to make sure that every family understands the facts about this important local issue on the November 8 ballot. So, what’s on the ballot – Hilliard City Schools is seeking voter approval of a combined 4.5-mill operating and a $50 million bond levy. These are two separate issues that are combined into a single vote. Why is it needed – Operating levies fund the day-to-day operations of the district, paying for things like teachers, supplies and utilities. The last levy was approved by voters in 2011 and was expected to last three years. Thanks to strong fiscal management and a great collaboration with our employees, the district has stretched those funds to last for five years. Also, the district is expecting 1,000 new students in the next five years. Additional classroom space will be needed. This is why a new middle school is planned for district owned property next to Hilliard Bradley High School. What are the options – This levy request is about maintaining the excellence in our classrooms and ensuring adequate space to keep up with growth. If the levy passes, it means we can maintain our high quality of education. If voters do not approve the levy then the district will enact cuts that are already approved by the board of education. This includes cutting 60 staff members. These are not threats, this is the reality of how school funding works. We cannot pay for what we cannot afford. Please take a few minutes to make sure you know the facts about Issue 58. Thank you for your continued support of our schools! Please visit our website for details on this important ballot issue. This week we began learning more about choosing books that help us grow as readers. WE know we read LOTS of books! Some books are Read to Me, Read With Me, or Read By Myself. Read to Me (books we will need another reader to read to us) Have lots of words, few or no pictures, the print is tiny, and we can't solve the words even when we use our strategies. These are books I think of as lap books, cuddle your little one in your lap and enjoy the book together! Read with Me (books I can read mostly by myself and figure out tricky words but might need help with a few words when my strategies fail.) Are books we are highly interested in, the pictures support our reading, we know most of the words or can figure them out. This is a good place for a reader to be! You will still want to sit down with this reader and enjoy all they've learned to do! Remember to talk about the story too! Reading is about finding the message and learning not saying words! Read By Myself (books I can read all by myself) Are books I can read, think and talk about ALL BY MYSELF! Consider recording these readings, calling someone special to read too, reading to a pet, or a sibling. Look for a reading graph to start this week! Yep, I found a way to combine the student's LOVE of graphs with a purpose! We will do the graphing at school; you won't need to do anything with the graph! Feel free to talk about it as you see appropriate. While our the focus of lesson has moved from word solving we are still practicing these skills in our reading AND students are accountable for using these strategies to solve unknown words. As I confer with readers in small groups, individual conferences, or work with the whole class, I will be supporting needs as they arise. So, as we pack this tool in our tool box we are learning (adding) another. We have entered into GOAL SETTING and allowing the writers to take ownership over their writing development. We began as we were all gathered on the carpet for writing workshop. I asked the writers to reflect on our learning thus far in writing workshop. After giving the kids a few minutes to reflect I grabbed a sheet of paper and asked them, "Writers, what would you expect to see in a piece of writing?" They looked at me and paused, no hands shooting in the air and no shout outs. Finally, a brave soul said, "Pictures and words." I turned to my paper and drew a tree in green and wrote tree with the same green marker. "How about this? I have words, and I have an illustration." Immediately, the kids began to add ideas, " NO, you need a sentence and more than one thing in your picture and you used only one color." "Ok, how's this?" " It's better Mrs. Frazier (first graders are so compassionate) but, you still need more." "We can do like three sentences and three illustrations to match our words." "Well, we can still do more." I replied, "YOU CAN! So, what would it look like if we tried one more time?" "We would write lots of sentences, with matching pictures to help our reader." "I think we should have feelings in our writing and lots of colors. One color is kind of boring." "We need punctuation marks too, and we can write ideas from our mentor authors." "WOW! You know a lot about writing! I grabbed my final paper and began creating just what they'd asked me to do. When I finished, I taped each sample on a piece of chart paper and labeled each with a number for easy reference. Next, I asked the writers to think about their writing reminding them they could be anywhere on this chart. "We are all working hard to grow, and each one shows us a step in growing as a writer." Before sending the students off to write, I asked them to envision the writing they were planning for today. Then, I handed each writer a pre-cut piece of a post-it-note ( The super sticky notes to ensure it's power to stick.) and requested they place their name with the writing they would aspire to do today. 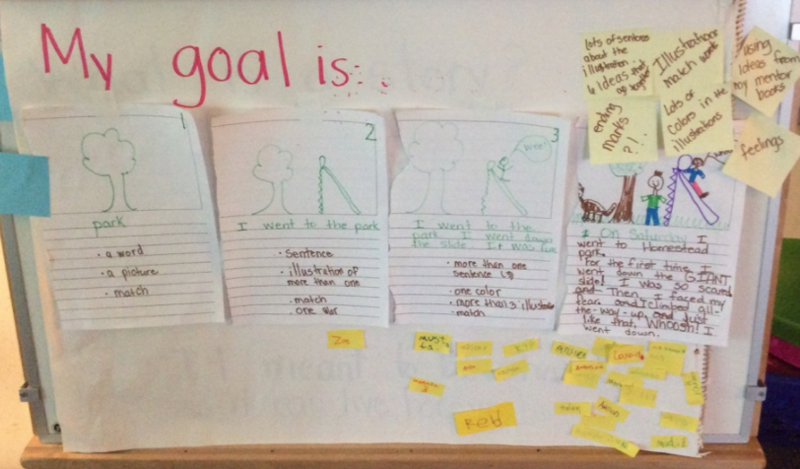 I have been so impressed with the grit the kids have been applying to their work since setting goals! On Friday, as we were packing up for the day one student said, "When are we going to make a five? I am writing one now we can use." I guess Monday; we are making a five! We have completed our dream statements and they are hanging proudly in our room. We refer to them daily. When we have an opportunity to make a students dream come to fruition, we do. For example, Mason W. has a dream that we are a classroom that takes care of people outside of our classroom and inside. (the son of a healthcare professional, can you tell?) As we are learning about the meaning of Veterans Day, being a Veteran, and showing respect to our Veterans we are realizing Mason's dream. As we fill the tub with donations for our Veterans, we are realizing Mason's dream and learning to be compassionate. Help us realize Mason's dream and support our veterans! #1 BRING IN ITEMS for care packages that will be sent to men and women all over the WORLD! It’s easy! Just bring in items and place it in the Blue collection container by your classroom door. A Synergy member will pick up from your classroom daily and keep a count of items. A running total will be kept on the Synergy Bulletin Board. Each item will count towards your class total. On November 11th, the class with the most points will get a COOL award! WE NEED TO WIN THIS!!! Travel size- shampoo, lotion, hand sanitizer, individual tooth brushes, small toothpaste, Q-tips, cotton ball, deodorant, decks of cards, boot cut sock, hand/foot warmers, water bottle flavoring, pop tarts, individual cereal boxes, ziploc bags all sizes, and many more. Go to www.hilliardvetparade.com and click on “HELP FILL A TRUCK” tab for a full list of items to collect. #2 HELP US COVER THE BULLETIN BOARD WITH VETERAN PICTURES! Bring in “COPIES” of Veteran pictures from your family or friends. Make sure it includes their name, branch and years in the service. 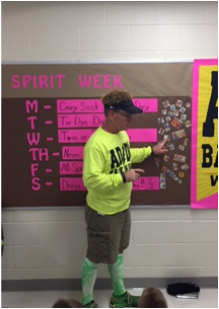 Place pictures in the container by the bulletin board by the gym. #3 WE NEED LETTERS!- WE ARE DOING THIS ONE IN CLASS, but letters from home are welcome too! Write letters to a Veteran. They can be as simple as “Thank You” or include questions. If you ask questions in your letter make sure you place your first name, teacher’s name and Darby Creek Elementary on it so the Veteran will have a place to send a response to if they desire. Our SYNERGY CLUB GOAL is to have at least one letter per student at Darby Creek by November 10th. Letters will be distributed to Veterans at Darby Creek and at the Veterans Day Parade in Hilliard on 11/11/16 at 7:00pm. Place all letters in the container by the bulletin board by the gym. #4 VETERANS DAY PARADE- I will be there! Lets try to meet to in front of the Dairy Queen and show our support as a class! Come to the parade. It is on Friday November 11th at 7:00 pm in Hilliard. It starts at the Fairgrounds, goes through Old Hilliard and ends up at the park by the West pool. The Veterans would appreciate our support! If you go to the parade, you will see us collecting more items for care packages from other people in the community. MORE PARADE INFO CAN BE FOUND AT www.hilliardvetparade.com. 11/16--Steve Harpster will visit DCR students for the day! 12/20--1:45 Winter Sing-A-Long; 2:00 Winter Parties--remember healthy balance please! ​On Friday, November 11th, the SYNERGY Club at Darby Creek Elementary School would like to invite Veterans to a Town Hall celebration honoring men and women who have been in the military as well as some of our outstanding caring students. The doors open for Veterans at 9:00 (Coffee and light refreshments) with the Town Hall meeting beginning at 10:10 in the gym. After the meeting this year we have added some socialization time for veterans in the media canter as well as some Veteran classroom visits for “Veteran story time” if desired. The students at Darby Creek are excited to welcome and thank Veterans for their service. This event is a Darby Creek Favorite! The SYNERGY Club needs your help to spread the word and invite any veterans that you know to Darby Creek Elementary School on Veterans Day for a Great Celebration! There are lots of PTO events going on this month! I have so many important pieces of information for you! Grab your calendar and a note pad, you might want to make a few notes as you read! As you know we have a levy on the ballot. Visit http://www.hilliardschools.org/issue-58-information//​ for more information. The rigor in reading has begun. We are learning to use the meaning of the story, letter sounds and the structure of the sentence to solve unknown words. Once readers are using these skills, they will need to read MANY EASY or FAMILIAR books to learn to use these skills automatically. Once kids can solve words to the point where decoding seems seamless we will increase the challenges in the words and text structures. These word solving skills need to be practiced everyday and in easy books to truly internalize the skill of decoding. Only when these skills are internalized can the reader focus on the comprehension while reading. Be patient with your reader. Rushing reading growth creates frustrated readers and readers who become word callers, not readers who read for meaning. Some of the students in our class are just beginning this journey and some are well into fluent decoding. Reading development can't be rushed or compared to other readers. It's an individual process and very personal to the reader. The workshop framework allows me to meet the various needs of the readers at multiple levels. I choose students to target student during a focus/group lesson. Individual conference during the independent reading portion of the workshop. Read to your child regularly and please help your first grader get the book and folder back in the book bag for the next day. ​Building an understanding of authors craft enables writers to write with intention and purpose. Using craft also ensures the audience reads the writing as the author intended. Many writers are beginning to dabble in crafting their own writing! As parents you can support your writers by talking about the crafting techniques they see in the books they read. Maybe it's the LARGE BOLD PRINT for yelling or italic letters that tell us to read quiet. Or the onomatopoeias used to tell us a dog is barking or the car zoomed by. Whatever the craft is it's there for a reason. Talk to your reader/writer about how this craft helps the story and your giving them ideas! You can read more about the growth of the writers here. We have discovered moving across, up or down on the hundreds chart is always ten more. 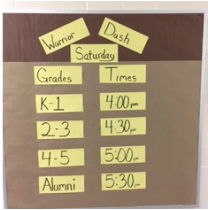 We counted our Walk-a-Thon laps and as a class we walked 309 laps! ​Counting efficiently has been our focus. Moving objects counted helps us be more accurate. Marking items counted helps us be more accurate. When counting a large group of objects it's helpful to count in groups of ten. Counting too fast is not accurate. The rigor in reading has begun. We are learning to use the meaning of the story, the letter sounds and the structure of the sentence to solve unknown words. Once readers are using these skills, they will need to read MANY EASY or FAMILIAR books to learn to use these skills automatically. Once kids can solve words to the point where decoding seems seamless we will increase the challenges in the words. These word solving skills need to be practiced everyday and in easy books to truly internalize the skill of decoding. Some of the students in our class are just beginning this journey and some are well into fluent decoding. Reading development cant be rushed. It's an individual process and very personal to the reader. As parents you can support your writers by talking about the crafting techniques they see in the books they read. Maybe it's the LARGE BOLD PRINT for yelling or italic letters that tell us to read quiet. Or the onomatopoeias used to tell us a dog is barking or the car zoomed by. Whatever the craft is it's there for a reason. Talk to your reader/writer about how this craft helps the story and your giving them ideas! Ten and some more- We are learning to group numbers by tens and some more (beginning to place value) Listen to the EduCreations below to hear the language of our classroom. 10/16--7:00 p.m. Darby High School--Community R Factor Training for Families--hope to see you! The Teske's will be there!!! 10/23--7:00 p.m. Darby High School--Community R Factor Training for Families--hope to see you! The Teske's will be there!!! ACDC Warrior Dash~ THIS SATURDAY! Bring a perishable food item for donation.